Srinakarin Train Station Market is a weekend night market that mostly frequented by the locals, that’s the reason why they have a very big car park and not that close to any BTS or MRT station. However, this does not mean they are not tourist friendly; you just need to find your way to this local paradise. The direction to the place will be shown later at the end of the post. The market caters for the younger generation in terms of shopping, but if you are coming here for food hunting, just like Gibson? You are in the right place. 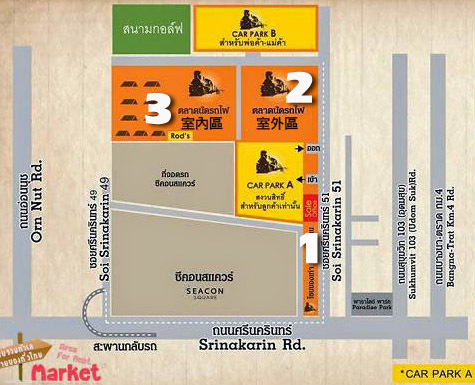 Srinakarin Train Station Market is basically divided into 3 areas, which are the main road shop lot area (Map1), the open space (Map2) and the indoor (Map3). These are the indoor area where you will find some interesting shops and cafés or pubs to hang around. However, Gibson was a bit too early as usual wanting to avoid the traffic jam; many shops here were yet to open. Spotted a Shipping Container Converted Restaurant here, but we opted to try the street food instead. Between the open space and indoor area, there is a huge hawker center that you can almost find all the street foods in Bangkok. This was what we got for our appetizer before heading to a Japanese restaurant for dinner. Grilled pork and seafood are available at almost every corner in Bangkok, but grilled mussel, scallop and bacon are something quite rare, and the technic used to grill is also extraordinary, as you can see the lady was firing the food while grilling them. There are 3 types of ingredients that rolled into the bacon to barbeque, which are Enokitake, Beech Mushrooms and asparagus. Gibson ordered the asparagus bacon for 30 Baht and grilled king trumpet mushroom for 15 Baht. A set of shell food consist of 3 mussels and 3 scallops costs only 150 Baht, but you can order only mussels or only scallops for a different price. Now we are heading to deep fried insects stall. The Sago Worm (clockwise) tastes like French Fried; The Grasshopper is surprisingly good that taste like shrimp, Crickets on steroids and Cricket are Gibson’s favorite that taste like dried shrimp and the last one is Silk Worms. They are all salty and mostly crispy and only the worms have the nutty texture. You can mix all the insects per serving that only cost you 40 Baht. Chicken and Beef skewer costs 20 Baht each. Thai are very creative when it comes to flavor; an ordinary cream puff can have as many flavors as you can ever think of. We tried the Green Tea and Chai Tea, they are both sweet but Chai Tea has a better texture. Each of this puff only cost 10 Baht. Straw Jelly looked good but it tasted like medicine, although 4 straws only cost 10 Baht, it is not recommended. At the entrance to the open space have a lot of food stalls too. The meat ball has a very funny hard and soft texture; Gibson was not really into it. Gibson’s friend bought a cup of Apple and Cinnamon flavored Infused Detox Water, a bit too sweet for all of us. At the main road shop lot area, you will spot some graffiti like this. We were having our first Japanese meal for the trip at Fue Sushi Bar, but we were quite disappointed with the taste although the foods look quite promising. So Gibson won’t be describing much about the food but to show only the price tags. Srinakarin Train Station Market is a bit far from any BTS or MRT station. The nearest BTS will be On Nut Station. After taking the exit 1, take a taxi for a 15-minute ride that cost below 100 Baht, normally around 60 – 70 Baht. Address: Behind Seacon Square, Soi Srinakarin 51, Bangkok, Thailand.